When promoting your company, you’ll do well to take a page from the book of Springbok Online Casino, and play directly to the loyalty of your selected citizenry, and this company deserves a medal for getting the patriotic blood of South African fans pumping. Featuring the country’s cherished national animal, as well as their beloved national rugby team’s emblem as their logo, they aimed straight for the heart! They further show their devotion to South Africa by boldly displaying the ‘green and gold’ as their landing page colors, and without even playing one game, we’re convinced they’ve already won over their targeted audience. Client safety and security are high priority for Springbok, and they utilize evolving and regularly updated encryption technology to ensure the protection of all processed transactions on their servers. Springbok offers a range of trusted and secure deposit and payout banking options to choose from for funding your account or withdrawing your winnings including Visa, MasterCard, Easy EFT, Bitcoin, Wire Transfer, Skrill, Neteller, EcoPayz, and Secure Instant Deposit. Transactions are processed in South African Rands, with the exception of Neteller which occurs in Euros. The overall waiting period before earnings reflect in your account average around 48-72 hours, with the e-wallet options being the quickest methods available. South African clients are in love with the SID payment method as this web-based service allows patrons to deposit directly out of their bank account through the online banking facility, with payments instantly debited from their account and immediately credited to the merchant. Fast, Easy, and Convenient! Springbok Online Casino says Hi to all newcomers at their establishment with a generous welcome bonus. When signing up for at Springbok for the first time you will be entitled to receive n splendid bonus to the value of up to R 11,500 which is spread out over your first three deposits made: the first deposit allows you to double up by being matched 100% up to R 1,500, and the second and third deposits offer a match-up of 50% up to R 5,000. There is a 30x playthrough requirement on the bonus and deposit with Scratch Cards, Pai Gow Poker, Keno, European Slot Poker, Bingo games, 7 Stud Poker, and all Slot machines contributing 100% towards meeting the rollover conditions. Springbok has quite a range of different rewards and promotions on offer and the Comp points system is an easy means to free money. All gamers are automatically included in the comp system as soon as they register for an account, and the system works by earning you comp points for every wager placed, with every 100 accumulated points being exchangeable for cash credits at the cashier. One point is earned for every R10 bet placed, and 100 points can be traded for R1. There is also an exclusive 300% on any deposit bonus promotion, which enables you to an extra R600 on a maximum R200 deposit made. Simply click on “Redeem Coupon” in the Cashiers section, enter the promotion code “SPRINGBOK 300”, and stand ready to receive a little extra green in your account. Additionally the site offers a 25% cashback bonus on every deposit made without using a deposit bonus; a 100% Lucky 7 bonus where the first 77 players responding with a specific bonus coupon code earn an extra 100% bonus up to a maximum of R777; Numerous slot tournaments; as well as the chance of being offered an exclusive place in the VIP club, with all the associated perks. You can always feel safe at Springbok Online Casino where the bouncers are muscled, and the security is tight with the utilization of radical encryption technology incorporated into the software, ensuring all banking transactions and personal information is safely stored away from prying eyes. The long and the short of it is – Springbok has your back while you are free to concentrate on your gameplay. The gaming platform is extremely user-friendly and a pure pleasure to navigate, with all useful and valuable information regarding games, banking, terms and conditions, etc. thoughtfully laid out in prominently categorized tabs. Springbok offers a downloadable version of the casino, but we prefer the more flexible instant flash play version which is immediately accessible through any Mac or PC browser. Why waste time and hard drive space when you receive the same quality of play with a conveniently saved bookmark? The mobile casino is a compact version of the big daddy and although there are dedicated apps available from the respective phone stores, the more convenient route, as always, is the instantly accessible portal through your iOS or Android smartphone and tablet browser with all the fun available on the small screen for our on-the-go customers. Springbok Casino have opted to power their gaming library through the internationally known and prestigious RTG (Realtime Gaming) software provider, and here you will find an impressive selection of more than 410 games on offer. RTG is an industry leader in providing high-quality games brimming with outstanding animations, superb graphics, and sound, and deliver exactly this and more in the Springbok catalog. All games on Springbok’s menu are conveniently categorized under prominent tabs on the home page, making selection an easy process. Springbok’s slots category contains the largest assortment of titles available, and here you can choose between exciting titles like Caesar’s Empire, Bubble Bubble, Fruit Frenzy, and Ghost Ship. Under the Progressives tab, you’ll find Megasaur, Spirit of Inca, Caribbean Hold’em, and Caribbean Stud Poker, and the Reel series of video slots present entertaining themes like Bulls and Bears, Naughty or Nice, and Crystal Waters. A pleasant addition to the slots games are the turbo play, which speeds up the action considerably, and the Autoplay option, where you calibrate the settings for options like “Spin till you Win” or “Automatic spins” for a set period of time. The Table Games gallery features firm favorites like Baccarat, 21 Blackjack, Pontoon, and Tri Card Poker, as well as a variety of Roulette options like American, European, French, and Multiplayer. Video Poker fans can pick and choose between numerous names including Aces & Eights, All American Poker, Deuces Wild, and Jacks or Better, among others. The Specialty games category contains American and European Roulette, Craps, Keno, and Treasure Tree. Professional and knowledgeable representatives are available around the clock to assist you with any problem or issue you might encounter. Reach out for support in either English of Afrikaans by dialing the toll-free number on 0800 983 080, or the landline number on 1 678 349 0095. Alternatively, you could also send off your question via email to [email protected], or simply click on the Live Chat option for an immediate response to your most burning questions. Knowing and catering exclusively to your client’s needs is an important aspect for any successful enterprise, and it’s, therefore, a huge pleasure to land on an online casino that accommodates and caters exclusively for a particular demographic region, all the while proudly displaying their loyalty in both a grand and subtle fashion. Springbok Online Casino was designed with South Africans in mind and personifies all things important to these residents. Mindful of their users safety, Springbok have made use of the latest in encryption technology to ensure secure banking transactions as well as the protection of individual’s personal information; they have brought in an industry leader in software design to power their gaming library and offer a massive range of top-notch graphically pleasing titles to choose from; an easy to use and navigable user platform for both instant and mobile play; and a dedicated support center that handles each query in a friendly and professional manner. 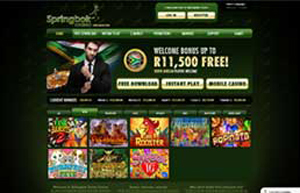 The incorporation of the graceful impala as their logo, the use of the national sport team’s colors as a dominant design feature, and the bilingual English and Afrikaans platform shouts SA in one resounding voice, and we are proud to award Springbok Online Casino a dedicated spot on our list of recommended online casinos for South African gamers. Go Springbok, go, go, go! Springbok Casino has been in operation since 2002, are licensed through and have a certificate of good standing with the Curacao e-gaming provider, offer a range of valid banking methods, and trade in ZAR, so yes, they are most certainly considered a legitimate gambling establishment. Where do I find Springbok “No Deposit” bonus codes for 2017? All new players are eligible for a welcome bonus which is divided into three separately made deposits, and you can use the following codes for each respective deposit: 1st Deposit – “SPRINGBOK100”, 2nd and 3rd Deposits – “SPRINGBOK50”. How do I reach out to customer support? Springbok offers various means of getting in contact for assistance, and you can contact them telephonically on either 0800 983 080 or 1 678 349 0095. Alternatively, send off an email to [email protected] or try out their instant Live Chat option.